Source: Produced in E. coli and biochemically synthesized in vitro. Formulation: Liquid. In 50mM TRIS pH 7.5, 1mM EDTA and 5mM DTT. Purity Detail: Ubiquitin mutants [K48C] and [D77] were expressed in BL21 (λDE3) E. coli. Proteins were purified by cation exchange chromatography. Di-ubiquitin was synthesised by linking [K48C]ubiquitin and [D77]ubiquitin in the presence of ubiquitin conjugating enzyme E2-25K (UbcH1) (Prod. No. BML-UW9020) and human ubiquitin activating enzyme E1 (Prod. No. BML-UW9410). The product was purified by ion exchange chromatography. Purity was confirmed by SDS-PAGE and protein concentration estimated by absorbance at 280nm. Application Notes: Di-ubiquitin may be used to aid investigation of ubiquitin binding entities with chains of defined length and character. Scientific Background: Polyubiquitinylated target proteins, are a prerequisite for investigating the mechanistic coordination of chain recognition, substrate unfolding, and peptide bond hydrolysis by the 26S proteasome. Ideally these substrates should be homogeneous by several different criteria: overall purity, polyubiquitin chain length, chain linkage, and site of chain ligation to the target protein. Historically, well-defined substrates have been unattainable because of the low purity and abundance of E3 enzymes, as well as the uncontrolled character of chain elongation as catalysed by available E2 and E3 enzymes. To overcome the chain elongation problem, a method using the well-characterized ubiquitin-conjugating enzyme E2-25K (Prod. No. 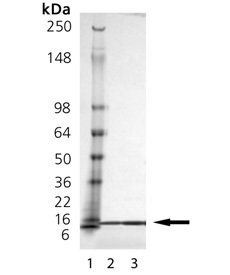 BML-UW9020) to generate Lys48-linked polyubiquitin chains of defined length has been employed. This method avoids uncontrolled polymerization by utilizing, in each round of synthesis, two chain reactants, one reversibly capped at itsproximal, and the other at its distal, terminus. Di-ubiquitin may be used to aid investigation of ubiquitin binding entities with chains of defined length and character.